I'm not a professional cook, a professional blogger, or a professional salesman, just a regular everyday mom doing her best to cook good food, gluten free. Come check out my recipes, my links, and my product reviews. Stay a while, make a gf friend or two, and share your thoughts. Welcome! Thanks for the tips on finding a new way to eat while my diet is so restricted. The doctor is pretty much convinced that I have a food issue, so for a month I need to keep a food journal and keep my restrictions. He did give me back dairy, however, and told me to hold off on everything else. So, keep the ideas coming! Any help you can send my way that doesn't involve plain meat with a side of plain veggies is much appreciated. I always wonder why things can't just be stable with my health, but as many of us with auto-immune disorders know, that's not always the case. No dairy, no grains, no potatoes or corn (because I eat them both almost daily). Good news: I've already lost 5 pounds. I need carbs. I can't really function well or keep my blood sugar as stable as I like without them. I need variety. There's only so many salads I can handle. I need to stay away from soy and dairy. I need to do this for at least 2 weeks. I need ideas. How do you keep variety and interest in what you eat? How do you keep your nutrition balanced? Any help you can give me would be greatly appreciated. If you have a favorite reference, cookbook, website, or recipe you can share, that would be awesome. Maybe it's the fact that Paula and I are close in age, or maybe it's that our blogs have similar titles, but I really love this new blog I found! I went looking again for GF blogs with good recipes that I (1) am interested in and (2) can cook from, and one of the ones I found was Live Free, Gluten Free by Paula. Like many GF bloggers, she posts a weekly menu with easy links to recipes she's posted before. She posts regularly - not like spastic little me - and the recipes she puts up are super easy to understand and follow. There's a lot of variety in the foods she cooks, so the recipes are interesting. She has younger kids, so there are plenty of kid-friendly recipes as well (like the McDonald's style nuggets and fries). If you're looking for a new blogger to follow, check out Paula's Live Free, Gluten Free. It's a wonderful blog. Yeah, that's what I said! Microwave brownies. 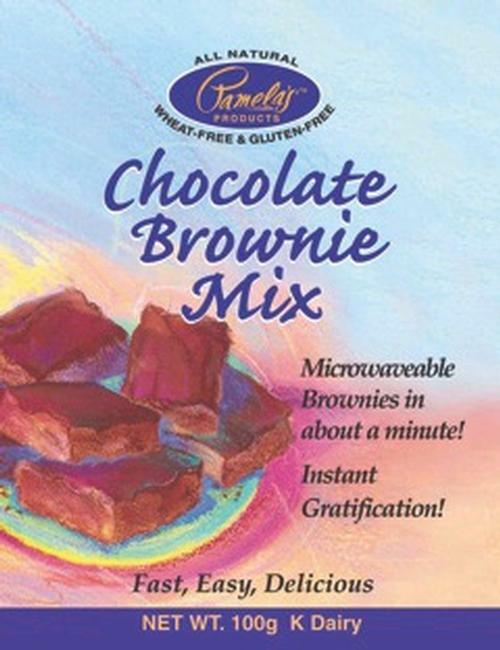 At the gluten-free food expo in DC this month, one of the many samples that Pamela's was handing out was a single serving packet of microwavable brownies. They did not disappoint. Pamela's brownies have long been my favorite GF brownie: great taste, awesome texture, easy to prepare, easy to make in a variety of ways, good counter life. They are just an overall great brownie. These little one minute brownies were just as good. I wished I had some ice cream to make a sundae with (one of my favorite things to do with a brownie), but even just alone, the warm brownie was perfect and delicious. They should be out in stores in September, so be sure to grab some. They are awesome. A perfect 10. Yesterday, the CNMC's Celiac Disease Program hosted their first annual Gluten-free food expo. I was so excited to be able to go! I didn't eat lunch, so that I'd have plenty of room for all the snacking, and - even though it was a small gathering - there was plenty to sample and tons of goodies to take with us. For $5, I bought a red cloth bag (reminiscent of the grocery ones) in support of the CDP. By the time I left, it was nearly full. It was $10 to get in the door, and then the feasting, coupon gifts, free samples, business cards, and buying was ON! Bard's beer, Tamari, Pamela's, Rudi's, Delight Magazine, General Mills, Choice Batter, Udi's, Glutino, and so many others were there. My favorite were the little personal businesses. I bought cream puffs and soft pretzels. I wish I could have taken home some of everything! There were several small business people from Pennsylvania, and they all said that they ship items. Were you able to make it to the expo? What did you think of it? What makes my world go round? Dang it, but I truly love brownies. I might go so far as to say that I luurve brownies. Giving up brownies when I was diagnosed with celiac disease was the hardest thing I've ever done. Pamela's brownie mix is my all-time favorite. It's so good, that my gf-shunning husband will even recommend making brownie sundaes out of them. I adore them, and although they're not cheap, they're an easy easy mix to use and the results are terrific. There's big chunks of chocolate in the mix, and they bake up nice and fluffy and delicious. Another nice perk of the mix is that there are several different preparation variations on the bag. I usually make the original recipe, but I've also made the vegan recipe once. My mother was in town, and I wanted her to be able to share them with me. They were a little less fluffy that way, but they were still tasty! If you're ever looking for a great gf brownie, my vote goes to Pamela. Super yum. Testing, Testing.... Is this thing on? Well, I wanted to let you know that I had the chance to try Triumph Dining's new Gluten-Free Restaurant Guide and it is awesome. I don't live near a big city or anything, and don't eat out much, so it took me a while to really get a feel for it and get used to using it. At work and over the holidays, though, it really made it's worth known. If you've been debating whether or not you should get one and wondering if it would be worth it, then yes. YES it's worth it. And it's easy: you can look up restaurants by city or by name, either one. I leave it in my car so that it's with me everywhere I go. I really can just go out to lunch now like I used to, and it's super great. God's awesome, and while I may not be your traditional Christian, God is the center of my everything, pal. You'll have to excuse me for being a fairly normal human in tandem with that. Why make another gf blog? "Why not?!" Is always the answer to that question. I wanted to have a place where I could specifically hook up with people with Celiac disease and others who eat gluten free. I wanted a place with my kind of food, food reviews, and local information for the mid-Virginia area. I wanted a place where my food friends wouldn't have to wade through personal stuff and my personal friends wouldn't have to wade through food stuff. This Blog is Changing and moving. Are you a SITSta? Welcome, welcome, welcome!